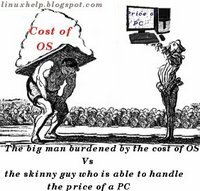 Does an OS have to be costlier than the hardware on which it is run ? Does an OS have to be as costly or even more than the hardware on which it runs? This seems to be the question that I am forced to ponder myself again and again. When I open the day's newspaper, I am besieged by ad after ad offering to sell PCs at bargain prices, some of them as low as $250. To list an example, I came across this newspaper ad offering the Dell Poweredge SC430 Server which features an Intel Pentium D Dual Core Processor 820 with 1GB DDR2 ECC SDRAM, a 250 GB SATA hard drive and an embedded Gigabit NIC for around $ 455 (US Dollars). Oh yeah, they also throw a 1 year onsite warranty and free lifetime telephonic support to boot. Now when you consider this with the estimated price of the yet to be released Windows Vista (ranging from $199 to $399), one can't help but gawk at its price. Not to talk about Microsoft's future plans of recognizing the OS and Software it sells as a service rather than a product - in which case the end user is left with the further liability of shelling out money on a yearly basis for upgrades - something similar to paying mortgage for your home. Why should the OS be priced at par or even more than the hardware on which it runs ? Shouldn't it be the other way round? For instance, lots of efforts and tangible materials go into the making of each computer. And this effort put into it proportionately increases as you manufacture/assemble larger quantity of computers. It doesn't decrease or remain the same by any count. Then there is the logistical nightmare of storing and delivering the finished product to the end users. Also when you sell a computer, you end up relinquishing control over the product in exchange for the money. But when it comes to developing a software or OS for that matter, none of the above rules hold true precisely because an OS is intangible by nature. It is possible to distribute the OS to 10s, 1000s, millions or billions of people and still the creators of the OS will have the original OS with them. The logistical problems are a bare minimum for the simple reason that the OS can be distributed via electronic medium such as the Internet. And if they are providing boxed versions, it takes up much less floor space than computers. Yes efforts and costs are involved in creating a robust OS. But once the main coding is done and finished, the further costs incurred by the OS company is mostly on marketing, bug fixing and in adding new features. For instance, of the reportedly 57,000 strong employees working at Microsoft world wide, a large percentage of them do jobs related to marketing. This obvious mismatch in pricing of proprietary OSes is precisely one of the reasons that GPLed OSes are increasingly gaining favor among the computer users. The ideological factors apart, it doesn't cost an arm and a leg to acquire GNU/Linux even if you opt for one of the numerous GNU/Linux distributions which are sold for money. And the fast paced advances of the various projects developed to run on this OS (Gnome, KDE, Wordprocessors, Web Browsers, Graphic editors.....) make sure that the end user is not left wanting in his computing needs. So the next time your hands start itching to buy the latest state of the art proprietary OS , ask yourselves this question. Is the mismatched price of the OS justified ? And what are the other avenues one has which gives more or less the same user experience without lightening your wallet by any measure? Because the companies that release the software have to make enough money to cover the perks, like free soda. Are you freaking kidding me? A top shelf operating system is vastly more complex and takes vastly more technical man hours to produce than a computer. Operating systems are a bargain. I just installed Ubuntu on my Macbook, and I have to say that it is awesome. I agree wholeheartedly with what you are saying, but someone has to play the devil's advocate. If you can pick up a PC for $250, then why not? I understand, you will not be able to upgrade further down the line, but if someone needs a simple PC right then and there, then this is a solution. GNU/Linux can challenge this when venders start selling cheap systems pre-loaded with Linux. Until then, the Microsoft monopoly continues.. There is another aspect to the hardware vs software cost. Producing hardware in units of millions has a certain environmental cost, the raw materials must be obtained, refined, parts must be produced, components assembled, all of which requires consumption of natural resources and energy. Selling computers on a mass scale has consequences for the environment, which manufacturers (and consumers) compensate in taxes. Anyway, just thought I would mention it. The price isn't determined by what the final cost will be, the price is determined by what they charge hardware manufactures. For years now, Windows costs about $45 per copy to suppliers like Dell. Microsoft says, it's been years since a price hike. We're now going to charge you (HP, Dell, Sony, etc) $60/copy for Vista. Then, they just keep the same margins as they had before and volia! the new pricing scheme. I have been using Ubuntu Linux and Yellow Dog Linux on my PMac G3 B&W and PMac G4, respectively, and both are excellent. The PMac G3 has a 1GHz CPU and 1GB DRAM. The G4 has the original 400MHz CPU and 256MB DRAM. I also have a 2GHz AMD Athlon with 1.5GB DRAM (yee-haw!) that runs Slackware GNU/Linux. Yellow Dog Linux cost me $29.95, Ubuntu cost me nothing, and Slackware cost me $19.95 at my local Micro Center. I use all three boxes regularly, especially the G3 B&W, and all of them rock. However, an even more graphical representation of your point is LTSP, or the Linux Terminal Server Project. There are two educationally oriented "turnkey" LTSP distributions, called K12LTSP and Edubuntu. I haven't yet used Edubuntu, but I can tell you that K12LTSP allows you to upgrade an entire 40-station school computer lab for US$4000, instead of the US$40,000 that it would normally cost. Yes, one-tenth of the cost; I've actually done this. "Not to talk about Microsoft's future plans of recognizing the OS and Software it sells as a service rather than a product - in which case the end user is left with the further liability of shelling out money on a yearly basis for upgrades - something similar to paying mortgage for your home." I agree completely here with the article. This idea of shelling out money on a regular basis for a software that has already been bought is plain thievery. If they feel the software/OS is to be a service, then why don't they provide the same pricing scheme as say subscribing to cable TV for instance? First your analogy of yearly payments for software being like paying your mortgage is incorrect since you never end up owning the software. It's more like paying rent. And to the poster who thinks it's harder to write an Os than to design a computer: You obviously are totally ignorant of the complexity in the designing and building of CPUs, Memory, and support chips. You must think the hardware just magically appears and then Dell just throws it together. I think your forgetting that the low cost computing hardware we enjoy is made from low-paid factory workers in Asia. How much would a dell PC cost if it were built in the US? As a convicted monopolist, Microsoft shouldn't be able to charge substantially different prices for retail versions of its OS and OEM licenses. If it costs $300 for Vista in a box, it should cost $300 (or at least $250--volume discount) for Dell to preload it. Consumers need to feel a real bite in the cost of the OS. A volume discount making a $300 OS cost only $60 for an OEM is an obvious sham. Furthermore, they shouldn't be allowed to sell the stripped-down versions to OEMs that only come with rescue CDs. They should be required to sell the full, complete retail version of the OS, and the actual retail CDs should be included with the computer. ...Are you freaking kidding me? A top shelf operating system is vastly more complex and takes vastly more technical man hours to produce than a computer. Operating systems are a bargain. The complexity comparison with a computer is off base. Try comparing all the man-hours that went into developing the processor chip, the graphics chip and the other components. These took huge efforts, and there is still an incremental cost for each new chip produced. Even so, those componenets and the computer they're bundled into are still cheap compared to the OS. The Athlon 54 has 233 million transistors. The Pentium EE 955 has 376 million transistors. ... and that's just one part of the hardware. Windows has about 40-50 million lines of code. Linux has about 30 million. You also have to design and fab the motherboard and chips, the disk drive, etc. You don't even have a screen yet. An operating system can be built with a handful of people working in their house or wherever in a few years. After an operating sysem is built the copying cost is next to nothing. I don't think that Microsoft expects people to shell out full retail for the new OS. They expect people to buy new computers with Windows installed by the manufacturer. There's a bit of a symbiotic relationship at work. MS needs PC vendors to sell their software, and PC vendors need MS to release new software to motivate people to buy new PC's. In the case of Vista, the PC vendors may not be getting what they want from MS. I doubt that many people will buy a new PC to get Vista. operating system is vastly more complex and takes vastly more technical man hours to produce than a computer. Operating systems are a bargain." That is why open source works so well. Having many more men and women cuts the number of man hours down significantly. It isn't so complex from the developer perspective since they only need to concentrate on a small portion of the OS itself. I heard this before, and it came from IBM: they always said that mainframes would always be more expensive than their OS. Then Digital challenged that with the minicomputers, and then IBM shoot itself in the foot with the DOS deal with Microsoft. Linux is a good enough OS for the current state of the art... I expect new stuff coming from those that have something to gain from it, be it BeOS, Microsoft or Apple (even Linux: it will get IBM's support for innovation until they change their strategy - IBM could change focus to AIX again in a heartbeat).